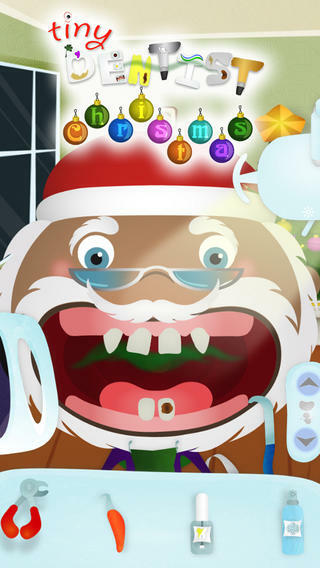 FREE for a limited time – Tiny Dentist Holidays: Christmas. Too many cookies for Santa has landed him in the dentist’s chair! Kids get to be the dentist for a day with the holiday version of this educational app. Like Tiny Dentist, this app teaches about dental treatments and the instruments that dentists use to keep teeth healthy. 24 patients with dental problems need fixed. The “dentist” has the tools to: remove cavities & fill in the hole, remove plaque, use water & air sprays, remove decayed teeth, put on braces, and more! He/she also has 36 fun braces, 18 hair styles, and 6 unusual kinds of toothpaste to use. The app was developed to help alleviate children’s fear of the dentist. Another fun feature of the app is the ability to take before and after pictures of the patient. The app is rated by Apple as 9+.